This calm, reasonable person inspires confidence in others. On Capricorn-Dog can be expected in the most difficult situation, one of his presence calms and gives hope for the future. He is benevolent, responsive, feels his responsibility to people. 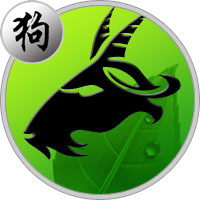 Such a Capricorn is more open and compassionate person in comparison with other representatives of this earth sign. Friendly Dog teaches his kindness and patience, endows sincere generosity. According to the combined horoscope, the Capricorn-Dog is attentive, sensitive to the sufferings of others. Is able to make sacrifices for the well-being of people and their own ideals. Has high moral principles, has a reputation for being decent. These people are rational, balanced and absolutely self-confident, while friendly and simple in communication. Capricorn-Dogs are distinguished by a calm, judicious nature. They do not hurry to prove their own importance to the surrounding people, but they also do not miss the favorable opportunities to improve their lives. The main feature of the Capricorn-Dog sign is responsibility: it has a sense of duty to people. He is a good and faithful friend, ready to defend the interests of loved ones until the last. Perfectly gets along with others, but few people share their thoughts. Capricorn-Dog looks at a person for a long time before he begins to trust him. As a result: a narrow circle of friends. But he can rely on each of his friends — it’s his protection and support. The principled, high-moral Capricorn-Dog enjoys great authority among his close and simply familiar people. Caring with respect to others: always listen and help. He does not refuse material assistance, although he knows the account of money. The Capricorn Dog is a thrifty and economical person. And a competent approach to the financial issue — a manifestation of sober prudence, not greed. Capricorn-Dog can not be called selfish, on the contrary, it is a generous and open person. However, he does not commit rash actions, is demanding and fair in relation to himself and others. Do not help unscrupulous people from basic considerations. In other cases, you can count on it: it always keeps its promise. Practical Capricorn-Dog stands firmly on the ground, in all things he succeeds. He thinks positively, even in case of failure, he remains cool. However, too focused on the result, can not relax and relax. In the society it is friendly, but it takes seriously everything that happens. It reacts sharply to criticism: it takes offense and closes in itself. He does not know how to laugh at himself, but it’s not so important, he has many other virtues: generosity, honesty, responsiveness. He always speaks only the truth, firmly believes in the decency of other people. In general, the Capricorn Dog is a strong person, capable of decisive action. But he will be glad to support and sincere praise, coming from the heart, but he does not need pity and flattery. Restrained Capricorns-Dogs seem closed and serious people — to such not to be approached. However, their harsh appearance is a mask, in the depths of the soul the Capricorn-Dogs are passionate natures. Just too selective in terms of dating. These little closed and judicious people are able to open their heart only to a really close person. But you can not doubt: their partner will bathe in love and care. It is difficult to find more loyal and loyal people in your preferences than Capricorn-Dogs. A love horoscope for the Capricorn-Dogs indicates a happy personal life. These people need a devoted partner, and their decency can be no doubt. Capricorn-Dog — a conservative, is wary of changes. He sees in the family a source of strength and inspiration, so he will not deprive himself of this reliable support: no ties on the side. The Capricorn Dog is an ardent devotee of order: every day is clearly planned. Demanding close: they must follow the rules established by them. Purposeful, decisive Capricorn-Dog is able to overcome any obstacles in its path. This disciplined person has got used to live on a clear daily routine. Capricorn-Dog — the ideal worker: attentive, diligent and very responsible. However, almost devoid of ambition: he will not sacrifice his life for a successful career. It will easily agree to an ordinary position, if he understands that it is here that he can bring the maximum benefit without compromising his mental health. For a serious Capricorn-Dog, speaking in public is a big test. Does not have enough imagination, a little shy of creative activity. He prefers to work quietly in the workplace, without attracting unnecessary attention. It is suitable for activities related to compliance with certain rules and regulations. Capricorns-Dogs are strict keepers of order and law, often devote their lives to serving people. They become law enforcement officers or choose legal specialties. For the active Capricorn-Dog there are no obstacles and obstacles. Purposeful, determined man boldly embodies his plans, not paying attention to life’s difficulties and troubles. He is a benevolent person, but moderately cautious, does not trust very much to unfamiliar people. It is distinguished by a reasonable approach to life. He is devoted to his work, responsibly to business, but his energy is more than enough for his personal life too. With closer acquaintance, women are found out that this serious man is a rather soft, vulnerable person, but very stubborn. Therefore, it is better to obey the will of Capricorn-Dog, to reconcile with his independent character. In return, a woman will receive so much love and care that she will feel infinitely happy. The woman of this zodiac sign combination is very lucky in business, possesses an enviable tenacity and purposefulness. Differs sharp mind, insight, so in dealing with business matters, colleagues rely entirely on her opinion. Although it is so independent that it does not need approval and support. In personal relationships, she tries to take the position of a leader, so she will be happy with a man who recognizes her superiority. But the Capricorn-Dog woman is very generous with respect to close people, makes a lot of efforts to create comfortable living conditions for her husband and children. Perhaps it is difficult, but it deserves to respect. The diligence of this woman has no boundaries, besides she tries to behave honestly and decently under any circumstances.